Interested in sponsoring National Charity League’s Annual Conference? Are you committed to building the next generation of women leaders? Consider sponsoring our Annual Meeting and Leadership Conference to reach National Charity League’s network of more than 70,000 Members! Your sponsorship will allow you to highlight your programs, products, and services. 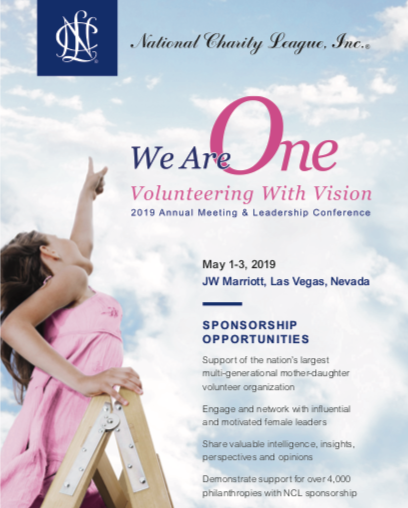 Consider being a part of the nation’s largest mother-daughter philanthropy organization through conference sponsorship. National Charity League, Inc. will work with you to design a customized package that best meets your needs and objectives, helping you maximize your investment and increase your visibility. View our Sponsorship Package and contact us to get started. George Argyros, his wife Julia, and family generously move their philanthropy through the Argyros Foundation, which gave away around $11 million in a recent year. Major gifts have gone to education & youth, health, arts & culture. Artis is dedicated to making the college admissions process as stress-free as possible by guiding families to take classes that matter and participating in activities that motivate students to grow. By focusing on developing passions, skills, and interests, applicants can build skills for their future education and career. Their talented team is dedicated to offering business insurance in a more efficient way to add value to businesses and provide a better insurance experience. (NFP P&C) provides comprehensive commercial P&C coverage to corporations and nonprofits across all 50 states. They carefully design and implement a customized coverage plan with competitive terms and pricing that are a result of their long-standing relationships with some of the industry’s premier carriers. Santa Maria & Company (SMC) is a risk management consultant and commercial insurance broker with deep expertise helping companies protect what is most important to them: their assets, their employees, and their futures. GetSomeGreek is a company that “GETS” you. One whose sole purpose is to make your memories special. They focus on making the perfect product created through a fun, enjoyable process. Digital Cheetah is a volunteer management software solution designed to enhance a non-profit’s efficiency and volunteer engagement.